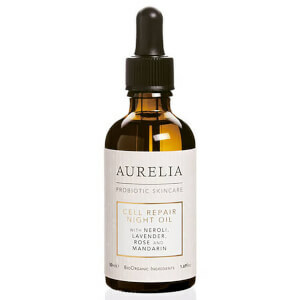 Rejuvenate skin whilst you sleep with the Cell Repair Night Oil from Aurelia Probiotic Skincare. Suitable for all skin types, including sensitive, the overnight treatment utilises Kalahari and Mongongo Oils to regenerate and strengthen skin, whilst Kigelia firms and tones to reveal a smoother, more refined complexion. Antioxidant Hibiscus is blended with Baobab, an ingredient rich in Omegas 3, 6 and 9, to fight free radical damage and environmental aggressors; combatting dullness and dehydration to restore a luminous, dewy appearance. Naturally fragranced with Neroli, Lavender, Rose and Mandarin, you can expect revitalised, youthful-looking skin come morning.